One of Turkey's most renowned football teams has finally ended a city's six-year long desire for its club to rank in the top football tier. 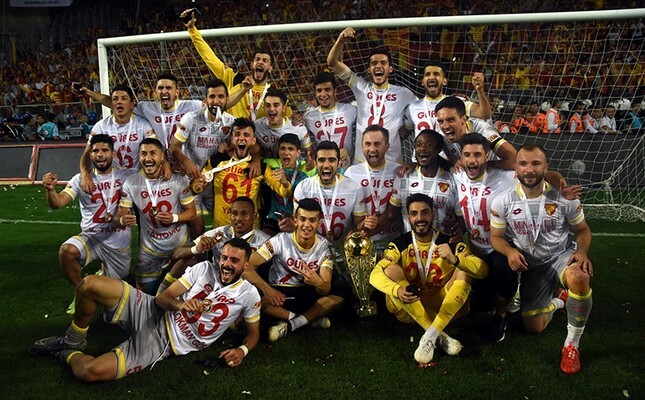 Famous for its fierce fans and successes in the late 1960's, Izmir's Göztepe has become the third team to advance to Turkey's Super League next season with a 4-3 win in a penalty-shootout Sunday at Antalya Stadium over another Anatolian legend, Eskişehirspor. Göztepe's return to the Super League also marked the end of a six year period without a club from Izmir being represented in the league. The city, which is the third largest in Turkey, was last represented at the top tier of Turkish football in 2010-2011 season by Bucaspor. Göztepe fans invaded the pitch after the match, while celebrations in Izmir continued for hours. The first-half of the match ended scoreless despite the fact that teams had to play for more than 45 minutes because fans threw torches onto the field shortly after kickoff, causing an extra 17 minutes of action. Nigerian striker Chikeluba Ofoedua made the opening goal for Eskişehirspor in the 53rd minute, on the finishing end of a counterattack. Desperate and on the brink of elimination, Göztepe managed to find life through a goal from Adis Jahovic in the 90th minute. The tied match went to extra time but neither team managed score, leaving no choice but a dramatic penalty shootout. Göztepe scored on three of their five penalties to defeat Eskişehirspor 3-2 and advance to the Spor Toto Super League for the first time since the 2002-2003 season. Having trained 32 clubs throughout the course of his career, manager Yılmaz Vural celebrated his fourth advance to the Super League as a First League team coach. Vural also managed Eskişehirspor and saw the team advance to top tier in 1995-1996 season. Playing in top tier of Turkish football for 25 seasons and still ranking in among the most successful Turkish clubs in European competitions, the 92-year-old Göztepe also marked a miracle comeback story. Despite being one of the earliest clubs to have achieved corporatization in Turkish football, as a result of its previous owner's financial problems- former media mogul Dinç Bilgin - Göztepe had been relegated four times in five years, and started playing in amateur league in 2007 for the first time in its history. The club was seized by the Savings Deposit Insurance Fund (TMSF) in exchange for Bilgin's debts. The tide turned for Göztepe after Altınbaş Holding, which concentrates in jewelry and energy sectors, bought the club from the TMSF for TL 1.2 million. The club quickly returned to the First League in 2010, but was relegated to the Second League in 2012-2013 season. This time, Mehmet Sepil, a native of Izmir's Göztepe neighborhood and the CEO of Genel Energy, came to the rescue and bought the club for $9 million in 2014. The club advanced to the First League the same season, and reached to the top tier Sunday after 14 tumultuous years. This period also marked a regression period for Izmir's football scene, which is among the oldest and fiercest in Turkey. Marking 41 years in top tier, Altay also relegated from the Super League in 2003, never to return and now competing in Second League. Göztepe's arch rival team, Karşıyaka, which is another club famous for its fierce fan base, has not played in top tier since 1996 despite playing two First League playoffs in 2009 and 2010, and relegated to the Second League last season. Having been promoted to the First League in 2014 after playing in second and third leagues for decades, Altınordu became the only team representing Izmir in this tier with Göztepe's promotion. Izmirspor, famous for its youth setup program and facilities, has been playing in amateur leagues since 2015. The rivalry between Göztepe and Karşıyaka has international recognition due to its intensity, while bloody fan riots often occur before or after the matches between two teams. The derby also holds the world attendance record in a secondary league game, broken with the participation of more than 80,000 fans from both teams, who attended the derby in May 16, 1981.